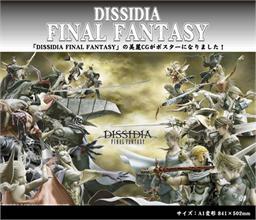 «©NCSX» Square's Dissidia game was a sales success in Japan but NCS expected a lot more tie-in merchandising. The potions were released last month and a strap has been announced along with a set of Trading Arts figures. 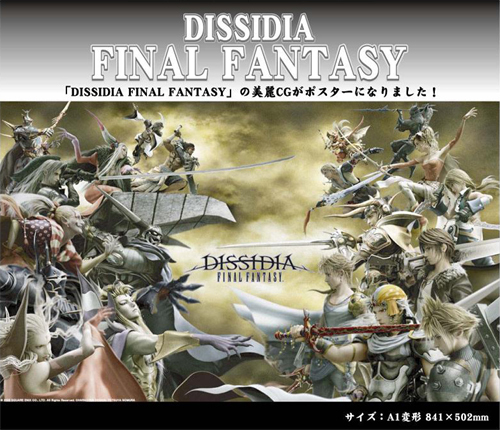 The fourth Dissidia tie-in product on the way is a poster which depicts the soldiers of Good and Evil arrayed against each other. Note how the warriors in the foreground are sedate but the fighters in the background are getting ready to slash. A cloudy ochre color wafts behind the cast of characters and serves as the backdrop for war. The poster measures 84.1 x 50.20cm (33.11 x 19.76") in area and will be rolled in a tube from the manufacturer. Are you leery of the lightweight mobile phone straps that lack gravitas? Do you want a strap that's more substantial? Each Dissidia PSP bundle includes a copy of the Dissidia Final Fantasy game and a ceramic white PSP-3000 which features an imprint of the Final Fantasy 20th Anniversary on the front of the unit which is located below the "X" button. Square Enix has set their sights on a bit of merchandising to dovetail with the upcoming release of Dissidia: Final Fantasy.